This 23rd March (2018) is the 86th anniversary of the martyrdom of three great revolutionaries, Bhagat Singh, Rajguru and Sukhdev. They were hanged for the crime to overthrow the alien British rule in India. The colonial rulers like elsewhere thought that with the physical elimination of these freedom fighters their ideas and dreams of a democratic-secular and egalitarian independent India would also die. The rulers were patently wrong as these revolutionaries and heir ideals continued to be an integral part of the Indian people’s collective memory. 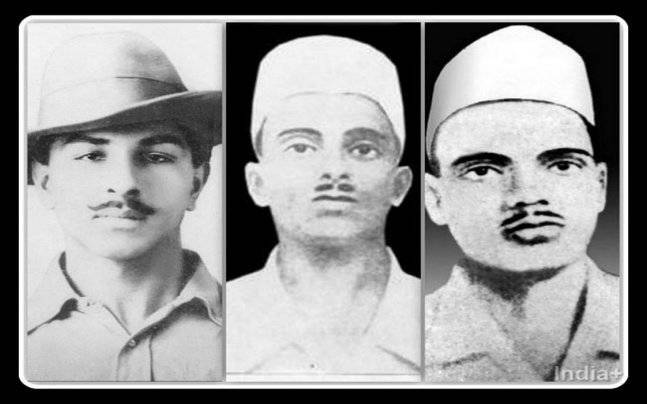 However, on 86th anniversary of their martyrdom we should not overlook the fact, that though these were the British, who hanged them but there were organizations like Hindu Mahasabha, RSS and Muslim League in pre-1947 India which not only remained alien to the ideals of these revolutionaries but also maintained a criminal silence on their hanging. Shockingly, RSS which claims to be the sole repository of Indian nationalism and patriotism,kept aloof consciously from the anti-colonial struggle, has lately been making all out efforts to own Bhagat Singh as its hero too. It displays his photos in its public meetings but also twists facts as per its polarizing agenda. For instance, when Valentine’s Day is celebrated in India on February 14, it comes out every year with sensational messages on social media that this day should be mourned as black day instead as it was on this day that Bhagat Singh, Rajguru and Sukhdev were hanged. It is atrocious and shows not only disregard of facts but also farcical love for revolutionaries by the RSS. They were hanged on March 23, 1931. “While studying in college (we) youth were generally attracted towards the ideals of revolutionaries like Bhagat Singh. Emulating Bhagat Singh we should do some or other act of bravery, this came to our mind often. We were less attracted towards Sangh (RSS) since current politics, revolution etc that attracted the hearts of youth were generally less discussed in the Sangh. When Bhagat Singh and his companions were awarded death sentence, at that time our hearts were so excited that some friends together [we] vowed to do something directly and planned something terrible and in order to make it succeed decided to run away from homes. But to run away without informing our Doctorji [Hedgewar] will not be proper, considering it we decided to inform Doctorji about our decision. To inform this fact to Doctorji was assigned to me by the group of friends. Perhaps this was the reason that RSS produced no freedom fighter what to talk of a martyr against the colonial rule. Unfortunately, there is not a single line challenging, exposing, criticizing or confronting the inhuman rule of the British masters in the entire literature of the RSS from 1925 to 1947. It seems it had only one task to accomplish and that was to fracture the united freedom struggle of the people of India. The democratic-secular India must challenge this evil appropriation of its heroes by the Hindutva gang. [viii] We should not allow this communal gang to kill Bhagat Singh, Rajguru and Sukhdev once again. [i] Rakesh Sinha, Dr. Keshav Baliram Hedgewar, Publications Division, Ministry Of Information and Broadcasting, Government of India, Delhi, 2003. p. 160. [ii] H. V. Pingle (ed. ), Smritikan-Param Pujiye Dr. Hedgewar Ke Jeewan Kee Vibhin Gahtnaon Ka Sankalan, (In Hindi a collection of memoirs of persons close to Hedgewar), RSS Prakashan Vibhag, Nagpur, 1962, pp. 47-48. [iii] M. S. Golwalkar, Bunch of Thoughts, Sahitya Sindhu, Bangalore, 1996, p. 283. [v] C. P. Bhishikar, Sangh-Viraksh ke Beej: Dr. Keshavvrao Hedgewar, Suruch Prakashan, Delhi, 1994. p. 21. [vi] M. S. Golwalkar, Shri Guruji Samagr Darshan, (Collected works of Golwalkar in Hindi) Vol. 1, Bhartiya Vichar Sadhna, Nagpur, 1981, p. 121. [viii]This evil appropriation of India’s freedom struggle icons by the RSS has another dimension which we should not overlook. Mahatma Gandhi, Baba Saheb Ambedkar, Bhagat Singh, Rajguru and Sukhdev whom RSS wants to appropriate lived and died for a democratic-secular India which RSS abhors and decried all attempts to establish Hindu state in India unequivocally.